GLASGOW, Scotland, Nov 30 (Reuters) - At least six people were feared dead on Saturday after a police helicopter crashed into a packed Glasgow pub. Witnesses said the helicopter dropped from the sky like a stone onto the Clutha Pub in the Scottish city at 10:25 on Friday night, trapping those inside in choking dust and debris. Police said they could not confirm any deaths but that 32 people had been taken to hospital and that others might still be trapped inside. Sky News, citing unidentified sources, said there were at least six fatalities. There were three people aboard the helicopter. "A full investigation is now under way. However, at this early stage it is too early to provide details on why the helicopter came down," said Deputy Chief Constable Rose Fitzpatrick. "We are working hard to recover people still inside the building and we will make further details available when we have them." As dawn broke, emergency workers were still labouring to free any people trapped in the rubble. 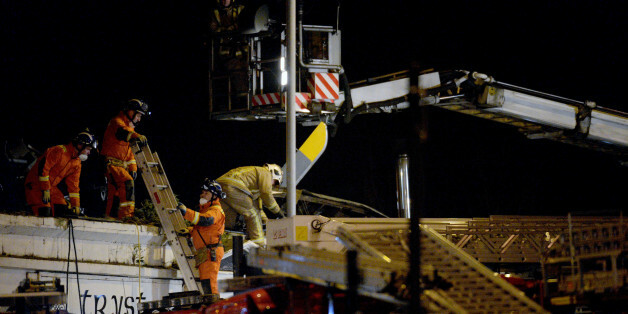 The mangled helicopter was embedded in the pub's roof. "We are in the process of making the building safe, it's very unsafe," said Assistant Chief Officer Lewis Ramsay, adding that rescue workers had been in contact with those trapped. Witnesses described scenes of horror as the 12-metre (40 ft) helicopter carrying two police officers and a civilian pilot spiralled into the pub in a busy area of Scotland's biggest city, destroying part of the roof. "It was fairly busy, we were all having a nice time and then there was like a whoosh noise," Grace MacLean, who was in the pub at the time told the BBC. "There was no bang, no explosion and then there was what seemed like smoke and we were all joking that the band had made the roof come down and then it started to come down more and someone started screaming and the whole pub filled with dust and you couldn't see anything, you couldn't breath." Police said it was too early to speculate on what caused the Eurocopter EC135 T2, made by a subsidiary of EADS, to smash into the pub. The helicopter did not appear to have caught fire. The Air Accident Investigation Branch has begun an investigation. "It looked to me like there would have been significant casualties from the speed the helicopter fell from the sky," said Gordon Smart, editor of the Scottish Sun newspaper who saw the crash. "The sight of a helicopter falling from the sky will never leave me," he told the BBC. There were around 100 people in the pub, listening to a concert by local band Esperanza. "Our only concern now is for the safety and welfare of those less fortunate than ourselves," the band said on its Facebook website. Caked in dust and blood, revellers rushed out into the street immediately after the crash. Arriving by chance at the scene, a local member of parliament, Jim Murphy, said people had run to help rescue those inside.